Teams from Bethany Evangelical UB hard at work with Serve FEST. From June 24-28, Bethany Evangelical Church (Carlisle, Pa.) held its first Serve FEST to meet some community needs. Thirty teens and adults fanned out in work teams throughout Carlisle and surrounding communities. 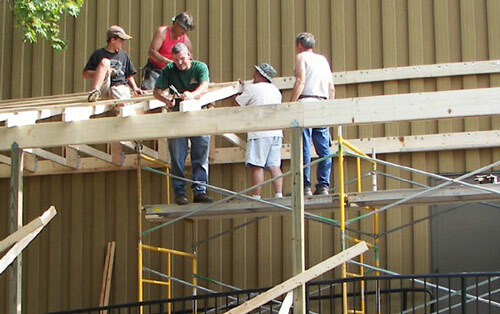 One team built an awning over the new client entrance at Project SHARE, the local food bank. Another team pressure-washed and sealed a picnic pavilion in a local park. A team of artists decorated “The Shack,” a ministry center for elementary school students in Boiling Springs, Pa.
Another team cleaned and served lunch at Carlisle CARES, a resource center for the homeless. Another team washed windows at the homes of a widow and a young couple who had their first child. Serve FEST was directed by Amy Moreno (right), Associate Pastor of Christian Education at Bethany Evangelical Church. She also led teaching and worship experiences each evening for the work teams. The teams were fed by volunteers from Bethany. “We were seeking to find tangible ways we could express the love of Christ while exposing our teens to the needs in our local mission field,” says Pastor Paul Dunbar. A post nearly two years ago told about the Oliver 1850 tractor that Randy Fennig took to Sierra Leone in 2008. But now you can hear Randy tell the tractor’s story in person in this two-minute video. The tractor is used in agricultural development in Sierra Leone. This year, they honored the Tuskegee Airmen, the military’s first black pilots. However, none of the nine surviving Tuskegee airmen from the Ohio chapter were able to attend–most would now be in their 90s. Bishop Emeritus Wilber Sites was admitted to the Intensive Care unit at the Chambersburg Hospital (Chambersburg, Pa.) on Sunday, June 27, for a G I Bleed (diverticulitis). The bleeding has now stopped he is stable. They expect a few days’ hospitalization to keep a watchful eye on him and to gain strength. Please continue to pray for his quick healing and recovery. 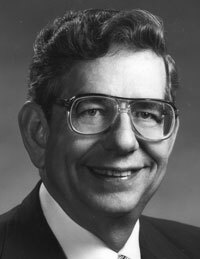 Today is Bishop Phil Whipple’s birthday. About 50 women have now registered for the UB Women’s Conference, scheduled for September 17-19 in Lancaster, Pa. New registrations will begin surging in now. To read about the conference, and to register, please go to the Women’s Ministry website. George Speas has been appointed interim pastor at Pleasant Valley UB church (Lake Odessa, Mich.), following the resignation of Ken Himebaugh. Ron Cook has been appointed long-term interim pastor at Criders UB Church (Chambersburg, Pa.) through 2011. The 19 members of the Honduras Medical Team returned to the States Saturday night, June 19. Co-leader Robert Cassidy called Donna Hollopeter in the Global Ministries office with an updated report. The team conducted five clinics during their week in Honduras, treating over 3100 people. They not only gave medical treatment, but prayed with people and were able to meet some other needs for various families (for example, provide funds for future surgeries that the team couldn’t handle, or arrange for ongoing medical assistance). Several members of the team hadn’t participated on the previous Honduras medical trips. They testified that it was a life-changing experience for them. Some persons, not being medical personnel, weren’t sure how they might be used. But everyone found a valuable role and kept busy all the time. Some took blood pressure, though they’d never done that before. One woman dispensed all 600 of the reading glasses she took with her, and could have given out hundreds more. The team stayed at a very nice facility in San Pedro Sula, the nation’s second-largest city. It was very secure and very clean, and the owner spoke English. Every morning they were fed breakfast, and at the end of the day, after a tiring clinic, they were able to jump into the pool. All of the clinics were held near San Pedro Sula. The two largest clinics were in areas that were basically suburbs of San Pedro Sula. They treated 830 people in one, and 750 in the other. The 19 participants came from these states: Kansas, Pennsylvania, Michigan, Virginia, West Virginia, Indiana, and Ohio. Thirteen people from the Mt. Pleasant Church (Chambersburg, Pa.) are headed to Zacapu, Mexico, July 15-26. They are beginning a partnership with a sister United Brethren in the Mexico National Conference. 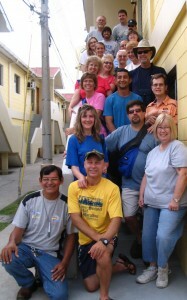 During their 11 days in Mexico, they will do some construction on the church and run a week of Vacation Bible School. A Facebook page is devoted to the trip. Donna Hollopeter received a call this morning from Robert Cassidy, co-leader of the Honduras Medical Team which is currently at work in Honduras. On Wednesday, June 16, they held their fourth clinic, this one in the seaside city of Puerto Cortes. They saw 804 people. That brings the total persons treated thus far to 2328. One member of the team brought 600 pairs of eye-glasses. They are all gone. Robert reports that everybody is in good health, that the clinics are well-organized, and that Rev. Benulda Saenz, the Honduran district leader in whose district these clinics are being held, has been terrific to work with. Today, June 17, the team will hold their fifth and final clinic in a small village outside of San Pedro Sula.